Whispers in the Loggia: In "Rome of the West," "Soul" Meets "Body"
Over the Arch... and, now, in the door. Tomorrow, of course, brings the installation of Robert Carlson as the ninth archbishop of St Louis... but the festivities are already underway, having kicked off tonight with Solemn Vespers (photos) in the Gateway City's mammoth, mosaiced "New Cathedral." As someone who is called to preach, along with my brother priests and deacons, I understand it as both a great privilege and a grave responsibility, which demands prayerful preparation and a sense of my own unworthiness. At the same time, we can never forget [that] as preachers and teachers the community calls us to a higher standard. Or, to put it in modern language our actions speak louder than our words. I remember preaching at a youth Mass several years ago and after the service was finished a young man came up and told me what a "hard message I had shared." At first I was rather proud, but later in prayer realized it was a "hard word" and not a loving word because I wasn't living it myself. I was sharing what you might call worldly wisdom, but the Gospel calls me to preach a heavenly wisdom that is pure, and peaceful and reasonable — flowing out of prayer and reflection. In some ways this allows us to become "living gospels" and our homily begins to resemble St. Paul's description of love in 1 Corinthians 13:4-7 — not pompous, not inflated, not rude, but rather one that rejoices in the truth, offers hope and leads the way to Christ. However, we must not only 'preach to the choir.' The Church must also be willing to engage the culture. This gets us in trouble when our teaching conflicts with the "wisdom of the day,” but it is also our duty as a moral voice in the community. Think about the values of the contemporary culture, and compare them with the values of the Gospel. Perhaps there was a time when the culture supported the values of the Gospel, or at least appeared to do so. But we now live in a culture that is not particularly friendly and is sometimes actively hostile to the Gospel of Jesus Christ. The Gospel invites us to choose life; the culture tells us that death is an equally legitimate choice. The Gospel tells us that Jesus is the Way, the Truth and the Life; the culture tells us that there are many equally valid ways, truths, and lifestyles. Jesus Himself tells us that the path to Heaven is narrow while the path to Hell is broad (Matthew. 7:13-14); the culture tells us that the path to Heaven is broad while the path to Hell is narrow. Not everything in our culture is hostile to the values of the Gospel. But, at the same time, the list of contradictions could be multiplied. Let's go right to the bottom line: If we can't point to a number of issues on which the values we live by differ from the values of our culture, then we have to wonder about the depth of our commitment to the teachings of Christ. I believe that our witness to faith, in word and deed, can win the day. And it is why I pray so often, "May the Holy Spirit get the last word." We must also be willing to establish partnerships with the ecumenical community and the civic community to accomplish what needs to be done in today's world. In the first Psalm (Psalm 15) for evening prayer we asked that God would bless us with justice and integrity in serving our neighbor and one another. As we pass this message on, we must remember that it is best accomplished by persuasion and service flowing from our prayer and personal witness. Mother Teresa spent an hour every day praying before Christ in the Blessed Sacrament. All Missionaries of Charity do the same. Explaining why this habit is part of the rule of their life — especially when there are so many other demands on their time and energy --- Mother Teresa said: "Because we find that through our daily holy hour our love for Jesus becomes more intimate, our love for each other more understanding and our love for the poor more compassionate." A Church that prays this way, drawing its strength from Christ in the Blessed Sacrament, finds its preaching more focused and I believe is better able to engage the needs of all those who pass by. They say that the strongest outreach to those in need is when the Church and the civic community and the business community work together. If we are going to love our neighbor as we love ourselves and love God with our whole heart we must come to understand what St. Paul knew well — "In Him who is the source of our strength we have strength for everything." 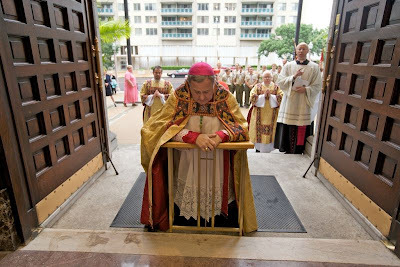 Having had a year to prepare for the arrival of Archbishop Raymond Burke's successor, the 2pm Central (3 Eastern, 1900GMT) Installation Mass is expected to be one of the finer liturgies you'll see these days. Livestreaming will be provided by the local Roundhouse and CatholicTV... and, keeping with what's now common practice, the worship aid's already posted for a sneak peek.